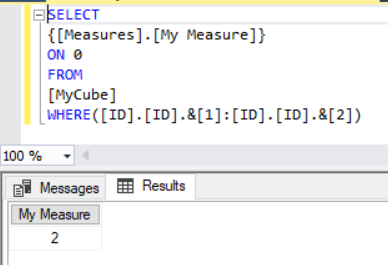 If you’re performance tuning SSAS Multidimensional Storage Engine issues, the Resource Usage Profiler event can provide a lot of useful information about what’s going on behind the scenes when you run a query. This is something I have blogged about in the past (and it will be useful to read this post before carrying on) but recently I’ve done some more research into this area and found out a lot more things about what this event tells you. For my testing I created a very simple cube from a single fact table. The table contained 5000 rows and two columns: a dimension key column containing the values 1 to 5000, and a measure column that always contained the value 1. 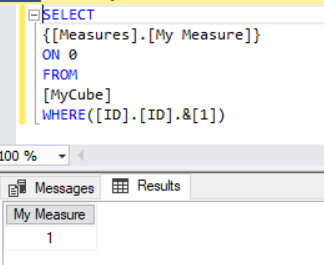 From this I built a single measure group with a single measure called My Measure, and a single dimension built from the dimension key column with 5000 members on it called ID. So in this case ROWS_SCANNED shows 256 because one complete page was scanned. Results in a ROWS_RETURNED of 257 and a ROWS_SCANNED of 257 – obviously 2 pages are now being scanned to get the data needed for the query. This must be because the final page, which doesn’t contain the full 256 rows, is scanned. 5000-136=4864, and 4864/256=19, so there must be 20 pages of data: 19 pages of 256 rows and one final page of 136 rows. I don’t think it’s worth getting too hung up on the exact values that ROWS_SCANNED and ROWS_RETURNED, especially given that they return totals for all Storage Engine activity for all measure groups for the whole query, but knowing that they tell you roughly how much work is being done my the Storage Engine means that you can use them to watch for warning signs that something isn’t working properly when you’re performance tuning queries. In subsequent parts of this series I’ll show some practical examples of this.